This product is not for Over counter sales and is available for installation only. Please contact us for a free quote. It’s a clean-sheet touchscreen design. 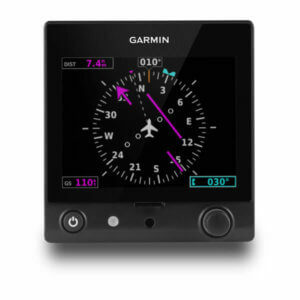 One that builds on the proven capabilities of our original G500 glass flight display series to offer you a vastly expanded array of features, options and panel layout possibilities. Backed by our No. 1-ranked product support team, the next-generation G500 TXi lineup makes it easy to configure a reliable glass cockpit system that can grow with your needs without overstretching your budget. 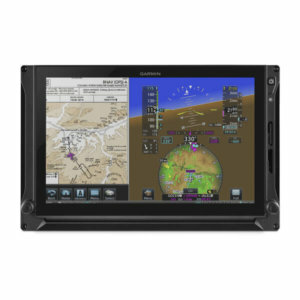 Designed specifically for FAR Part 23 Class 1/Class 2 aircraft (singles and twins weighing less than 6,000 lbs), G500 TXi glass touchscreens integrate with the GTN touchscreen GPS/Nav/Comm series¹ to provide a fully certified glass suite solution. Reliable attitude/heading reference system(s) (AHRS) replaces the old-style, maintenance-prone mechanical gyros in your system. Available in 7” portrait or landscape orientations — and in a larger 10.6” horizontal format — the G500 TXi displays offer a variety of configurations to fit your panel and budget. The 10.6” displays accommodate PFD information and a multifunction display (MFD) within the same unit. Optional engine, fuel and electrical readouts can also be viewed in a vertical strip alongside the PFD/MFD information on the 10.6” display. The 7” portrait format can be dedicated to PFD (with HSI map), MFD or EIS displays. And the 7” landscape format is configured to provide a dedicated, standalone EIS display. In configuring your system, you can mix and match up to 4 of the high-resolution touchscreen displays in your cockpit. 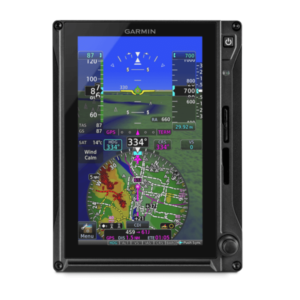 Or you can start with a single 7” portrait display serving as your PFD, and expand the system’s capabilities by adding additional G500 TXi displays. The variety of G500 TXi screen sizes and display orientations can support more than 25 different approved cockpit configurations. And each display offers the capability to have a built-in AHRS along with an air data computer (ADC) module integrated on the back of the display unit. As an additional option for remote mounting, a combined air data and attitude heading reference system (ADAHRS) is available, or AHRS and ADC units are available separately. 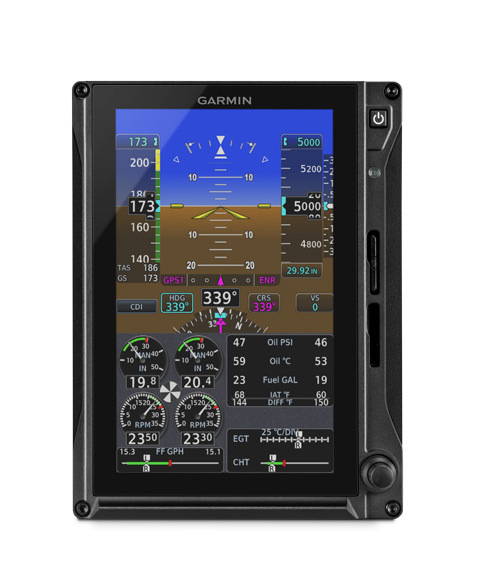 For aircraft already equipped with the original G500 series flight displays, full TXi compatibility with existing system sensors makes for an easy, cost-effective upgrade path. 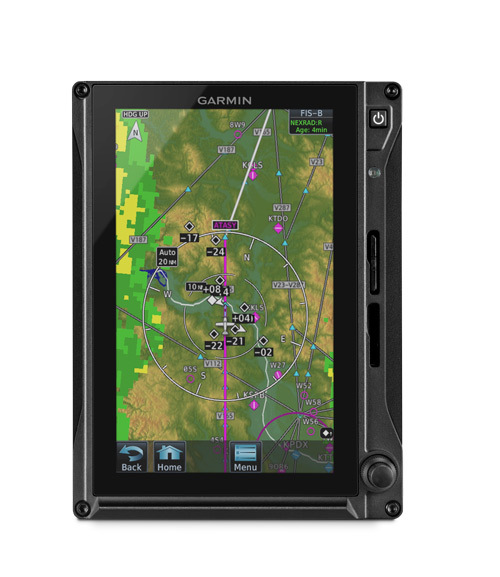 Whether it’s integrated in a split-screen view on the 10.6” display or shown on a dedicated 7” display, engine and fuel monitoring data is easy to access and interpret with G500 TXi. The optional engine information system is compatible with most popular Lycoming or Continental 4- to 6-cylinder engines (whether normally aspirated or turbocharged) and can provide support for both single- and twin-engine aircraft. Prominent engine gauges on the display provide real-time indications and support for lean assist mode, pilot advisories and more — enabling you to optimize fuel economy while maintaining high efficiency and performance from your engine(s). Better still, EIS data is automatically logged to an SD™ card and, with Connext®, is wirelessly downloaded to the Garmin Pilot™ app running on your compatible mobile device¹. This data can then be exported and analyzed by your service team. 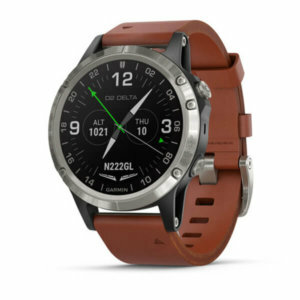 Garmin built the TXi series from the ground up by leveraging the experience gained in designing and fielding thousands of integrated flight displays. The TXi series features an intuitive menu interface that lets you use familiar knobs and/or touchscreen inputs to quickly access the functions, screen views and other flight information you want to see. Powerful dual-core processors boost the system’s graphical display capabilities — with faster zooming, panning and map rendering. 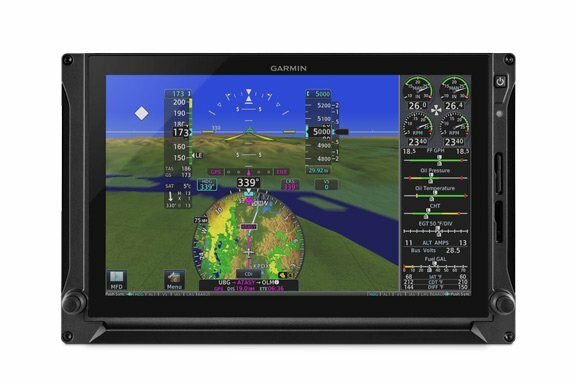 Optional Garmin SVT™ synthetic vision technology enables a 3-D virtual reality landscape to be integrated on the G500 TXi flight display. Plus, modernized fonts and backlighting offer improved readability and increased display clarity to help lighten your in-flight visual workload. To provide even more situational awareness, G500 TXi includes HSI mapping capabilities that put an MFD-like perspective map view within the HSI portion of your PFD. In addition to the geographical map, the HSI map view can also support the overlay of NEXRAD imagery and weather inputs from ADS-B and SiriusXM®datalinks. Additional overlays include SafeTaxi® airport diagrams, traffic, terrain and more. HSI map control and onscreen navigation are a snap, thanks to a Garmin innovation that lets you zoom in or out on the map, using a simple and natural single-finger swipe gesture. G500 TXi was designed to interface with a wide range of avionics equipment, including our digital GFC™ 600 series and other popular autopilots installed in Class 1 and Class 2 aircraft. You can use the G500 TXi touchscreens for control/display of heading, course and navigation source inputs as well as autopilot mode annunciations and more (with compatible inputs). As an option, separate dedicated PFD controllers are also available in 5 different control layouts for continuity with the specific autopilot system installed in the aircraft. G500 TXi also offers advanced integration capability with GTN series navigators, providing full touchscreen continuity between the navigation, communication and flight display functions in your panel. 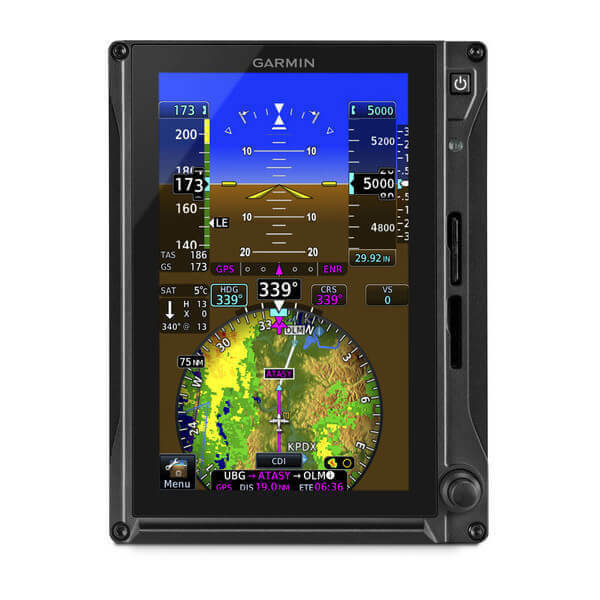 For extra piece of mind in systems where multiple displays are installed, G500 TXi is designed to enter a reversionary mode — allowing a single 7” portrait or 10.6” display to present primary flight instrumentation and engine indications (if EIS equipped) — in the unlikely event of another display failing or shutting down. The displays have backup GPS receivers built-in as well, providing redundancy in the event your system’s primary GPS navigator ever fails. In addition, an optional backup battery is available for the 7” portrait TXi displays. If there’s ever an unexpected loss of power to your avionics, this backup battery will provide power to your display for 30 minutes — allowing time for you to land at the nearest airport. 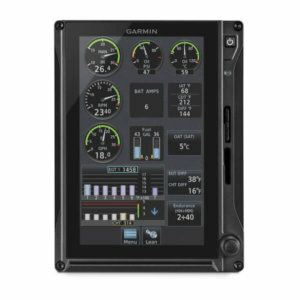 With this backup battery capability, aircraft owners who install dual 7” portrait G500 TXi displays with dual ADAHRS can forego the requirement for standby flight instruments², saving the weight and maintenance expense of vacuum-driven backup gyros. The all-glass era has truly arrived for GA aircraft. For even more ease-of-use functionality, team your G500 TXi displays with a GTN 650/750 series navigator and our Flight Stream 510 wireless gateway¹. 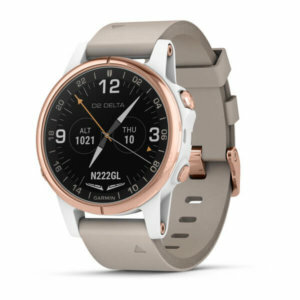 This setup enables our Connext wireless cockpit connectivity, which lets you stream information in real time between your avionics and compatible mobile devices running the Garmin Pilot or ForeFlight mobile apps. This turns your tablet or smartphone into a true cockpit interface. You can use your mobile device to create flight plans whenever and wherever it’s convenient, and then easily transfer the data to your avionics once you get to the airport. You can also wirelessly stream weather, traffic, attitude information and more from your avionics to your compatible device³. 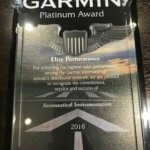 Plus, by using Database Concierge via Flight Stream 510, you can wirelessly transfer aviation databases downloaded to the Garmin Pilot app on your mobile device to your GTN 650, GTN 750 and G500 TXi system. 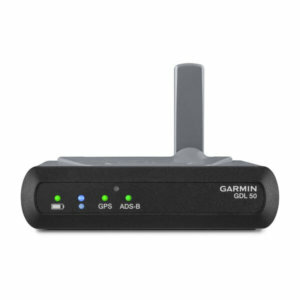 G500 TXi seamlessly integrates with a variety of optional sensors and datalinks to support the latest weather and traffic monitoring capabilities. Our Doppler-capable GWX™ 70 onboard color radar features a reliable, solid-state design as well as optional turbulence detection and ground clutter suppression capabilities. For pilots flying in the U.S., our GTX™ 345 series all-in-one ADS-B transponders provide easy access to subscription-free ADS-B weather and advanced dual-link traffic services. Plus, by installing a GDL® 69A satellite receiver with your system, you can add ground-and-airborne-accessible SiriusXM satellite weather and audio entertainment channels to the mix (subscriptions required). For a worldwide datalink solution, our GSR 56 datalink provides weather data and radar imagery through the Iridium® global satellite network. And for even more advanced traffic surveillance in high-density airspace, G500 TXi integrates with select TAS or TCAS systems, including our GTS™ family of traffic surveillance products. Don’t you hate it when another pilot starts twiddling with your avionics settings — and neglects to put them back the way you left them? 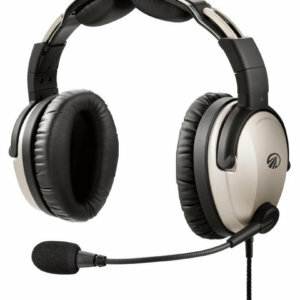 With G500 TXi, those worries are over. Your custom pilot profile settings can be saved4 within the system or loaded onto a removable SD card — which means you can also take your settings with you to another G500 TXi-equipped aircraft. Pilots operating within a flying club or flight school will especially appreciate this feature. Your preferred settings for backlighting, map settings and more can all be configured under your individual profile — allowing you to easily restore your system preferences prior to each flight. With installation approval soon to a be available for hundreds of aircraft models, retrofitting your cockpit with G500 TXi is a straightforward, all-bases-covered proposition. You can select from a wide range of display formats. And no matter which configuration you choose, you’ll be flying with the peace of mind that comes with an industry-leading 2-year warranty (and optional FlightLevel Extended Warranty), backed by our award-winning product support team. See your authorized Garmin installation center to get on board with a G500 TXi upgrade for your aircraft. 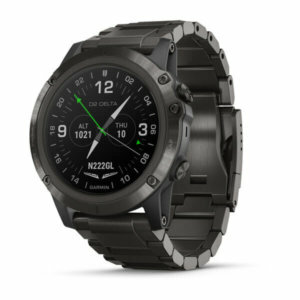 Garmin products have been designed for compatibility with a wide range of avionics. GTS 825/855 GTX 335 is TIS-A traffic only. Turn your Apple iPad® into the ideal training tool. The TXi Trainer app realistically simulates the capabilities and user interface of our TXi series displays — so you can train like it’s the real thing.